The new BMW 2 Series Gran Tourer is the first premium compact model to offer up to seven seats and fully meet the mobility requirements of young families. It has just gone on sale with an entry-level price of €35,940 OTR. Compact exterior dimensions go hand in hand with tremendous flexibility on the inside: a sliding second row of seats with adjustable backrest, a third row of seats that fold into the floor, and provision for up to five universal child seats are just some of the features on offer. 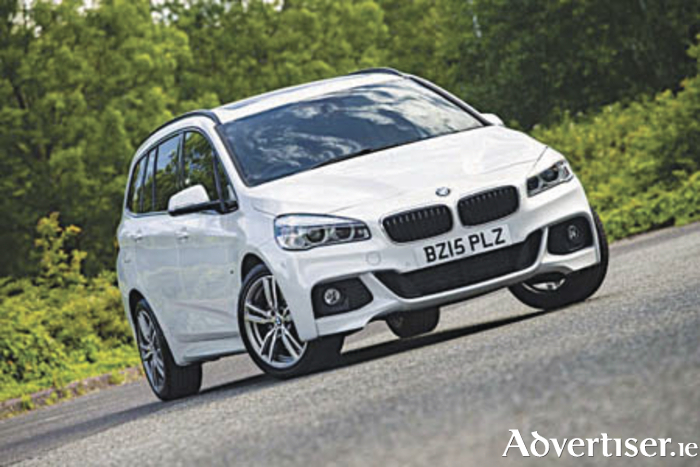 The new BMW 2 Series Gran Tourer is available with a choice of five turbocharged petrol and diesel engines, all sourced from BMW’s latest engine family. With either three or four cylinders, these advanced powerplants offer superb efficiency and, in the case of the 220i and 220d, a 0-62mph time as low as 7.8 seconds. The 220d xDrive is also the only car in its class to team four-wheel-drive with seven-seat capability. With the latest EfficientDynamics and ConnectedDrive technologies, the new 2 Series Gran Tourer takes advantage of BMW’s lead in driver safety, energy-saving, and connectivity features. And thanks to its typically BMW-like sporting dynamics, it fuses its inherent practicality with genuine driver entertainment, thereby creating a uniquely appealing package. For more information contact Colm Quinn in Athlone or Galway. Phone: (090 ) 64 65888/ (091 ) 753888.